From Dargaville you can drive south along the Pouto Peninsula, which forms the northern side of the entrance to Kaipara Harbour. Not only is the Kaipara New Zealand’s largest, it's the most difficult to sail into. The entrance is guarded by a treacherous sand bar. The Pouto Peninsula is itself a huge mound of sand. 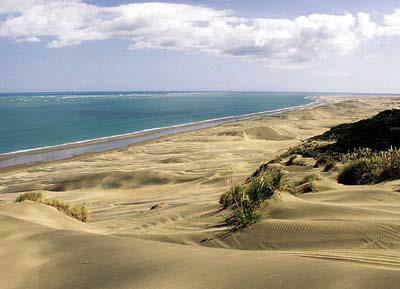 Features include huge dunes, fresh water lakes and valleys. The scenery changes regularly as the wind reshapes the dunes. An area just offshore is called The Graveyard, because of the many ships that were wrecked here (around 150 vessels). In certain tidal and sand conditions, the remains of wrecks may be partially exposed offshore or in the sand. From the end of the road you can walk to the Pouto Point Lighthouse. This three storey wooden lighthouse was built in 1884 and is now protected by the Historic Places Trust. At one time the Kaipara Harbour was the busiest in New Zealand, as sailing ships carried away timber from the region’s kauri forests. Running from the north head of Pouto Peninsula all the way to Maunganui Bluff is Ripiro Beach, a stretch of driveable surf coast that’s more than 100 kilometres long. The beach highway is bounded by cliffs of lignite, and it's easy to see the petrified and compressed rata leaves in the coal-like rocks. The beach incorporates the coastal settlements of Glinks Gully, Baylys Beach and Omamari. Aranga Beach is the end of the road, and the beginning of a coastal walk that leads all the way to the Hokianga Harbour. 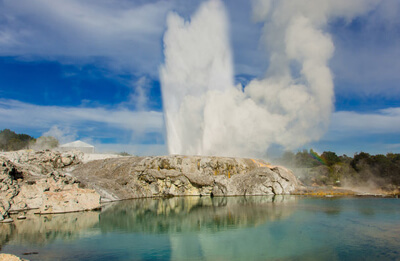 Why Travel in a Campervan When you are in New Zealand? RentACampervan Holidays Limited - T/A RentACampervan - New Zealand Motorhome Rental Specialists.